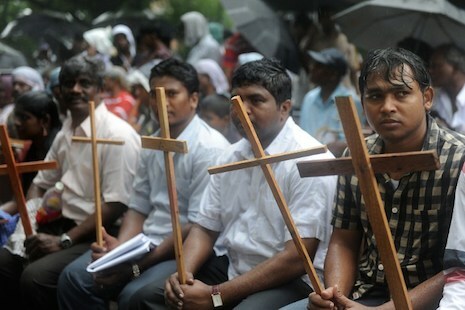 New Delhi (AsiaNews) - This August 10th will be a "Black Day" to highlight the discrimination suffered by Dalit Christians in India for 67 years. It is the initiative launched by the Indian Bishops' Conference (CBCI) Office of Dalits and the Disadvantaged Classes. In recent days, the bishops expressed their solidarity with the new president, Ram Nath Kovind, of dalit origins. They also want to remind people that the country implements a constitutional-based discrimination against those Dalits that embrace Christianity. The constitutional order of 1950 on the "scheduled caste", signed on August 10, 1950 by the then president of India [Rajendra Prasad, ndr] states that "No person professing a religion other than Hinduism may be considered a member of Scheduled Caste ". Subsequently, the order was modified to include Sikhs (in 1956) and Buddhists (in 1990). The bishops complain that civil petition 180/2004, which requested the deletion of paragraph 3 of the order of 1950, is still pending before the Supreme Court. That is, they argue that "the constitutional rights of Christian and Muslim Dalit have been denied for 67 years because of religion." Specifically, ecclesiastical hierarchies believe that paragraph 3 is "unconstitutional, a black page written outside the Constitution and inserted through the black door of an executive order." Hence the invitation of Msgr. Anthonisamy Neethinathan, president of the Cbci Office, addressed to all Christians in India, "to observe August 10 as a Black Day in your regions, dioceses and institutions." The event can take the form of "meetings, rallies, demonstrations, hunger strikes, memorandum, vigil and so on". Thus, concludes the bishop, "in your areas you can show support and solidarity to the Christians who suffer because of their humble origins. I urge you to use media, and in particular social media, to spread news in civil society. "